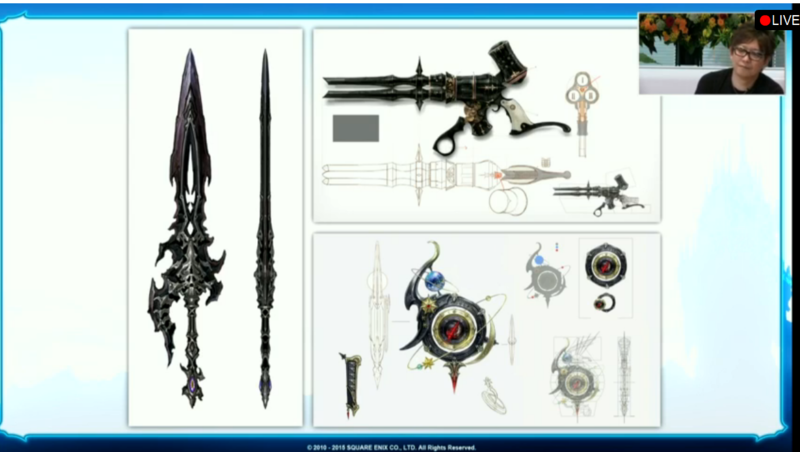 Discussion in 'Final Fantasy XIV News' started by Fybrile, Oct 25, 2015. Q6: What kind of bonuses are there for using a free company airship in exploratory missions compared to entering using the Duty Finder? A6: First, there are two ways to enter exploratory missions. One way is to enter using an airship built by the FC, and the other is entering after accepting a request from House Haillenarte in Ishgard. When challenging the content from House Haillenarte, you’ll need to talk to an NPC, so that will be handled via the duty finder. In addition to this, there are Easy/Normal/Hard difficulties for exploratory missions. The maps are the same; however, the monsters will have rank numbers 1 through 6 instead of levels. The FC route will be able to challenge the Hard mode. When entering with an FC owned airship, players outside of the FC may also be invited. However, this will require having two members from the FC who own the airship to be in that party. Players are able to fly up to 3 airships, so another benefit FC can get is that they can enter with three full parties, up to 24 players. Q7: What’s the minimum number of people that can participate as an FC? Is there a limit to how many people can ride on a single airship? A7: At the minimum, 2 players, and a max of 8 people can ride on an airship. Q8: Will it be possible to meet up with FC members who are already out exploring? A8: While it might be possible to randomly bump into them on the same island, you cannot indicate what specific island to land on. Q9: Will it be possible to ride on an FC airship that is already deployed on a voyage? A9: No, it will not be possible. Airships heading out on an exploratory mission will return back to the base after 20 minutes. Q10: You mentioned that we could trade unwanted equipment we find for points, but how exactly will we be able to use these points? A10: You’ll be able to use them on new flying mounts, materials necessary for new crafting recipes, red scrip materials, shards, materia, and more. You can also just desynthesize the equipment. Q11: I would like to participate in both fighting and gathering, would we be able to change our class/jobs while exploring? Q12: You mentioned that gatherers can take part in exploratory missions, but do we gather existing items, or special items? Q13: I think it’d be convenient to be able to earn esoterics while exploring islands, but will this be possible? A13: When starting an exploratory mission, you can obtain esoterics by completing three of the objectives listed on the map. Additionally, the starting point for each party will be different every time, and there will be 'aether turbulance' in the area in which you arrive. Attuning to three of these will grant you the ability to fly. You’ll need to do this every time you start an exploratory mission. The main attributes will comply with the item level’s stats, but the parameters will be random. There are gold/silver/bronze chests. Players can share the house up to 3 other players. Players can accept up to 2 house sharing invitations. Houses that have not been entered for more than 45 days and land that has not had a house built on it for more than 45 days will be automatically reclaimed. The time for this can be found in the Timers menu. Furthermore, after 35 days have passed, an email will be sent to all FC members (and owners of private houses) informing them. If you have been subject to automatic reclamation, you will be able to receive an 80% refund in gil for the price you paid for the land from the Resident Caretaker in the housing ward. You will also be able to retrieve indoor and outdoor furnishings that you are not destroyed upon removal. You will need to retrieve your refund and furnishings within 35 days after your house has been reclaimed. Automatic reclamation after 45 days is the result of testing based on player data. Flying mounts such as pegasus and wyvern will be introduced. New minions will be introduced. The ever-popular paissa can be obtained from Vanu Vanu beast tribe daily quest! This new feature allows players to enjoy characters and environments from different angles. Idling camera is like a screensaver where it’ll focus the camera on various objects near the player randomly. This feature will also apply a depth of field effect. Please try it out in different areas, you might find something new! I believe it was sometimes difficult to pose for commemorative pictures, so it will be possible to use this command to capture everyone’s poses perfectly. It will be easier than ever to take a picture striking that perfect pose, so please try it out! We will be re-adjusting various 2.x dungeons and trials, such as Garuda, for new players. Players will be able to try on several different pieces of gear at once. With this feature, players will be able to coordinate their gear easier. We will be adding the 1.0 gathering system as new mini-games in the Gold Saucer. A Gold Saucer category will be added to the weekly Challenge Log, and it will be possible to plan out how you earn you MGP. We’re implementing an adjustment to address the lag behavior. This will depend on the player’s environment, so we cannot guarantee the overall speed will be faster; however, it should feel much smoother than before. Please try it out and leave us your feedback. Additionally, as part of a job adjustment, we’re making detailed adjustment such as ninja/paladin’s TP, and other adjustments to bard and astrologian. It will be possible to purchase enhancement materials with an item known as ancient coins (name pending). While it’s a bit difficult at the moment to confirm this for sure, we are planning to start off by implementing the enhancement items for armor and accessories that can be purchased with Allagan tomestones of esoterics. Weapons will be a bit in the future. This will be a different from The Minstrel’s Ballad: Ultima, and it will be closer to an “extreme” difficulty. I believe it will be more difficult than Ravana extreme. It’s at a difficulty that can be enjoyed by those who have cleared Alexander Gordias (Savage) area 1. Originally we had planned to created 13 phases since it was Knights of the Round, but ultimately we made 10. We adjusted the battle so that it would be easy to clear for the main scenario, but the Minstrel’s Ballad: Thordan’s Reign is closer to the original balance planned by the developers. There are really good weapons on tap as rewards, and I think this will help those that are currently stuck on Alexander Gordias (Savage) area 3 and 4. Naturally, this isn’t a raid, and it can be cleared by those that have not challenged savage. Maaja, MasterBox, Jinzuku and 2 others like this. Q14: In general what does the item team in charge of? A14: Our team creates items such as equipment and crafting materials. There are about 500 to 800 items per patch. Also, for Patch 3.0, we had about 2,000 items. We also create quest rewards and item exchange shops. Q15: What is your favorite minion, and which minion was the most difficult to create? A15: The fighting action between Wind-up Louisoix and Wind-up Bahamut. It was the day when the game data needed to be finalized and this was an order from Yoshida, so it was implemented extremely quickly. Q16: Can you tell us of any secret minion features we haven’t discovered yet? A16: If you cook close to the fat chocobo minion that you can purchase with MGP, it will start doing it’s sniffing animation more frequently. Q17: Do you plan on making adjustments in the future to items such as Phoenix Down, elemental materia, and potions, which are not used very frequently by players? A17: Since there is a high possibility that balance is destroyed when using Phoenix Downs in high-end battle content, we’ll be keeping them as they are currently. Q18: Do you have plans to implement a feature, such as a book that records items you have obtained once, and you can drop that item but still use it for glamour? With this feature it’ll free up the inventory space. A18: Yoshida: We have no plans for this. We would increase the inventory space if this was possible. Q19: Do you have any plans to introduce primal minions? A19: Yes. We’ll start by adding an Ifrit minion in Patch 3.1. Q20: In a previous interview, Yoshida mentioned that racial gear might become dyeable, but how is this progressing? Also, would it be possible to make Allagan, High Allagan dyeable for glamour purpose? A20: We’re planning to add this as a crafting recipe in the future. Q21: Do you have plans to implement a new community item? A21: Of course! I promised to do this on stage during Fan Festival 2014. Q22: When gathering shards, do you have plans to add a bonus which increases the yield depending on the gatherer’s level? A22: It won’t increase the yield every level, but the trait added in Patch 3.0 (Nymeia’s Ward) which increases the yield for items without HQ. The proc rate is 10%. Q23: When will you be implementing a furnishing that plays the music from the game we want to listen to? A23: This has been planned since the dawn of A Realm Reborn. While we already have the spec sheet and music data, the developers have not yet completed their adjustments. However, we’d like to push for around Patch 3.2, so we’ll keep you updated. Q24: Do you have plans to add 3.0’s Y’shtola and Ysayle’s hairstyle? Q25: When will you be implementing a bent version of the bunny ears from the Gold Saucer? Q26: Do you plan on implementing an observer mode so that we can watch matches between other players? A26: While I can’t promise which patch we will be implementing it, we do have plans to do this. Q27: Are the minions earned from pre-order bonuses or optional item strong? I’m worried owning this or not will affect the outcome greatly. A27: There aren’t any rare minions that cannot be obtained at the moment that will be overpowered when compared to others. Q28: Yoshi-P, Hayashi, what are you favorite minions? (Hayashi) Tiny Tapir. I received this minion from a player I met in Eorzea. I’m especially fond of it because I received it despite it being quite difficult to obtain at the time. When four of the same minions are nearby, they can use a special ability. You can recover a minion’s HP by returning them to your gate. You won’t be able to attack your opponent while inside the gate; however, they won’t be able to attack your minions either. Minions have special abilities, depending on the special ability they will be able to deal greater damage to things such as shields and Arcana stones. There aren't many minions in the tutorial; however, in the actual game you’ll have many minions, so it’ll be important to pay attention to the entire field during the match. Q29: It seems like we’ll be able to have rated matches depending on our rank, but are there any penalties for disconnecting before you lose or other unsportsmanlike conduct? A29: If you are disconnected during a match, you will automatically lose. Q30: New minions will be added in Patch 3.1, but will we be able to have fun battling with just the minions implemented up until now? Q31: When using minions that have multiple characters, such as Minion of Light, or Wind-up Leader, will only one character appear or all of them? A31: The Wind-up Leader minion will be the character associated with your Grand Company at the time. If you are not part of a Grand Company, you won’t be able to put it on your minion hotbar. As for the Minion of Light, you can add each character separately (warrior, white mage, and black mage). Q32: Do Tank/DPS/Healer roles exist for minions as well? A32: No. There are only minion types. Q33: Are there any growth type of feature which increases the player's or minion's level by battling repeatedly? A33: No. Please obtain many different minions to try out. Q34: Would it be possible to obtain existing minions as a prize? A34: No. Please earn them through the existing in-game content. Q35: Are there any minions which can be obtained only through tournaments? A35: There are minions which you can obtain through tournament achievements. As a countermeasure to win-trading, which is mentioned a lot for Triple Triad, we have implemented a rate matching feature which will match players with close rank points. Q36: Will there be any new achievements added for Lord of Verminion? A36: Yes, new achievements will be added. Q37: In order to win a match, which is more important: rarity of your minions or the number of minions you posses? A37: Out of these two choices, it’s probably easier to adapt to different minion types with the more minions you possess. However, it’s not the case where you won’t be able to win because you don’t have a particular minion. It will not be possible to use advanced materia melding for primary stats on equipment created by crafters. We will be making adjustments in the future so that advanced materia melding can be used to enhance sub-stats. From Patch 3.2, crafted equipment will become more powerful that what it has been up until now. Furthermore, accessories will be implemented at the same time as the high-tier equipment that can be created by crafters. Additionally, materia slots will be added to raid equipment and the equipment that can be purchased with the various tomestones, so you’ll be able to add materia to boost the sub-stats that you prefer. Many of those attempting instanced raids in the early stages tend to use advanced materia melding on accessories, which lead to tanks being required to meld STR or VIT. Due to this there were times where the melded accessories were better than the accessories which dropped from clearing the instance. In order to resolve this issue, in Patch 3.2 we will be making adjustments that will change the damage calculations of tanks into a more appropriate state. As an overall plan moving forward, we will be making adjustments so that a burden is not placed on any particular role in order to challenge a high-difficulty raid. Around Wednesday, November 11th, around the time when Final Fantasy XI is receiving their grand finale, we’re planning to hold a collaboration event. It isn’t similar to the event we have done previously, this new event was created to match the scale of the grand finale, so please look forward to it! MasterBox, Jinzuku, Crimson Requiem and 2 others like this. Very curious about the grand finale. Is there a time of day that we know of? Or an all day event thing? They seemed to make it sound like it would be a like past FFXI and FFXIII events and be like a week or two long. As much as the XI now is so completely different from the "golden age of XI", there is a big part of my heart that really hurts to read the word "Grand Finale" for XI. It's very nice to see that Yoshida and Co. from XIV will be paying XI the tribute it deserves, specifically saying that this event will match the "scale of the grande finale". It paved the way for SE to make a sequel MMO, and there are chunks of XIV that are here because of XI. Unpopular as the guy may be because of 1.0's failure, I hope Tanaka returns during the XI grande finale to see a close to something he was a major part of for so long, even if it's just for the close. racooperii, Jinzuku and Fybrile like this. Wow I'm excited by all this news and upcoming adjustments to jobs and content. I'm really interested in what the new adjustments for BRD and AST is going to be. Or they could just make tank dps scale off VIT but I doubt that's going to happen. Raid gear with materia slots I thought I would never see the day. Be nice if crafted gear would be viaiable as raid gear but more customizable. I didn't spend hour and hours leveling 10 classes to max level and hour and hours upon hours gearing them. Not to mention the obscene amount of Gil it took to get my crafters and gatherers were they are today for fun. Yeah, that kind of makes me sad that it seems they dropped a hint that tanks' DPS will be nerfed (read: aligned with PLD's). Instead of a watering-down, I'd love to see them make the classes more dynamic. Buff Sword Oath, or your great idea about adding DPS off of VIT, or something instead of "tank=weak". Who knows what they have in store. The fact that it's not coming in 3.1 makes me feel like they're giving it a lot of attention and whatever they do will be well-thought-out at least. Yeah the only reason why STR was viable in 2.0 was because it also affected tank mechanics like parry but more importantly increased dps which resulted in more aggro. Now that 3.0 changed those mechanics and tank is left with just STR as dps gains and to a lesser extent aditional threat. Not to mention focusing on STR, VIT, DET, CRIT, parry/block is really pulling the job thin if not gear and balanced correctly. Now that I think about it out loud. It wouldn't be a bad idea if tanks really did have a primary stat. I didn't feel that they did when I was playing tank because you really only needed enough HP for tank busters and to survive mechanics. The other tank attributes like parry/block always felt really RNG to me and I don't trust RNG for mitigation. Making VIT or a stance for all tanks that utilize VIT for dpsing should have been a thing or should be a thing now. Well in any case. I enjoy my tank now and will continue to do so until they change it. I'll adapt to the upcoming changes just like I always have. Liking the stuff they are planning to add/change in 3.1. I'm just a little worried about it's going to be a case of Fallout 4 vs Patch 3.1 on the 10th November for many people (including me). Also I don't know if it's just be but I'm more excited about the small stuff like group posing and the idling camera then I am about the main headlines like Void Ark and LoV. daztora and racooperii like this. I haven't had a chance to decide yet... I will be downloading both, so... Might make more sense to start with FFXIV 3.1 as the smaller download... And as, I likely wont be playing it for weeks after I've got Fallout 4. I'm a little peeved that SE couldn't pick a better day. If they think they can compete, they're nuts. Alternatively, they could be hoping to hide a lackluster patch. Or, they're just ignorant about perhaps the biggest event in Western video games this year - which is hard to believe. I guess I'm just going to have to break up my time over both. It's times like this I regret taking my the reigns of my FC when the leader left. Crimson Requiem and GeekMatt like this. I linked to those a while ago, they are still rumored to be the relics for the 3 new classes, we won't know for sure until 3.15 and at this time there is no timeline for that patch. Yoshi did say they were going to work really hard on going back to the 3 month major patch schedule, so I would assume sometime around christmas for the relics. Jinzuku, Grupt and GeekMatt like this. All in all, a pretty good content upgrade. If these things had been in place with the launch of HW, it would have definitely earned the expansion price tag. Some much needed UX fixes. Looking forward to checking it out. Crimson Requiem and racooperii like this. Agreed. I thought HW was really lackluster especially since it was really story, a few new dungeons, a raid and a level cap increase. " The last boss for the Arboretum and Void Ark are some serious Nightmare fuel. Considering how many people are on hiatus to 3.1 speaks volumes about the state of the game. The expansion really felt like it was a patch with 50% more added to it. Somehow vanilla 2.0 just felt more epic in leveling up, or maybe it was just the newness/nostalgia factors. I think they have a lot of work cut out for them if they want to maintain a player base for as long as XI did. 2.0 was new and nostalgia at the same time. It didn't stop me from leveling multiple jobs to 50. I'm definitely taking my time this time leveling multiple jobs to 60. It just doesn't seem as much fun. I think the level grinding is getting to me...or because I'm doing everything twice on top of everything since I'm leveling and playing an alt.